So what if he's right just 39% of the time? On Wednesday, February 2nd, when poor old Punxsutawney Phil crawls forth from his simulated tree stump in Gobbler's Knob, we'll be watching. After all, if an octopus can predict the outcome of the World Cup, we fail to see why a sedated marmot can't predict the weather. Care to join us? VisitPA.com, the official tourism site of the Commonwealth of Pennsylvania is hosting a live stream of the event. Phil and his wild-eyed handlers are scheduled to make their appearance at 7:25 a.m. EST (4:25 a.m. PST), so you'll have to wake up early—or else stay up late—to catch the ceremony. But it's totally worth it. With snowfall in 49 of 50 US States, it's difficult to remember a time when the stakes have been higher. Not an early riser? 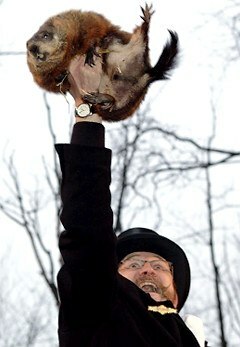 You can keep up with Punxsutawney Phil via his official (or unofficial) Twitter accounts or poke him on Facebook.